Like Tiny Tina, the sum total of what I know about Zer0 comes from the Borderlands 2 "Wimoweh" trailer: ninja assasin, has some kind of teleport dodge ability, floats red holograms in front of his face... and is also the first to speak in the trailer, saying "I have destroyed you. A deadly shot from nowhere," which is actually only the first two lines of the full quote; see Zer0 tends to speak in haikus, and you'll notice that those brief sentences contain five syllables and seven syllables, respectively; the final five, not present in the trailer, are a straightforward declaration of personal prowess: "The ghost assassin." Boastful! In truth, I'm not alone in my lack of knowledge - even in the game, nobody knows anything about Zer0. Is he a human? Is he a robot? Is he even a "he"? Zee became a Vault Hunter after contract assassinations got boring, but that's the extent of their known history. Their body is tall and impossibly thin, but that can just be chalked up to Borderlands' exaggerated art style. 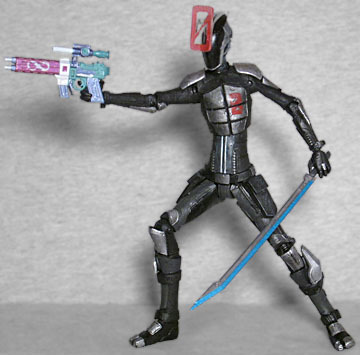 Zer0's creatation was inspired by other pop culture ninjas, like Snake-Eyes and Grey Fox, so of course they're wearing a black suit with some small silver armor attached to it. 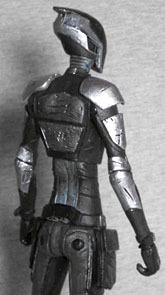 The armor is shiniest on the arms and legs, while the plates on the torso are more dull. There are large pockets on the pantlegs (though attach to the belt, for this toy), and the feet have a separate slot for the big toe, making them look like tabi boots. Zer0 wears a weird, pointy helmet (unless that is their head), featuring a smooth, featureless dome covering the face and tapering back to a point at the back. A silver frame wraps around the back the head, over the ears, and then down along the jawline. Of course, there's no way to duplicate Zer0's most noteable feature: the way holographic symbols pop up and float in front of their face to display various emotions. Oh wait there totally is! Okay, no, you can't just make holograms float in midair in real life - the closest we have right now is a light bar spinning so rapidly that human eyes can't see it, and there's no way McFarlane Toys was going to put that technology into a $20 action figure (yet). Instead, the figure includes a clear plastic... thing... that plugs into an unobtrusive slot on the back of the head, then hugs the scalp perfectly, and terminates in a large, stylized red 0 that's sculpted and painted to look like the one seen in the game. Now, the illusion doesn't work perfectly, but we're not going to judge them too harshly for trying something new and clever to represent something that is a physical impossibility in the real world. In fact, our only complaint is that we only get the zero, and not any other symbols. It should come with two or three! 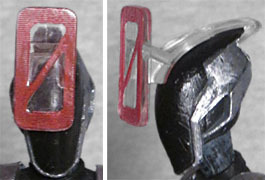 Zer0's other accessories include their sword and the Infinity pistol. The sword is cast from translucent plastic, then given an electric blue app on the sharp side of the blade, while the flat side is smoky grey. The Infinity Pistol is a colorful piece, silver and white and teal and fuschia, and an infinity symbol (aka a "lemniscate") on the barrel, signifying the fact that it never runs out of ammo. There's also a black display stand with the Borderlands logo on the front. A footpeg on the base will help keep Zer0 standing, which may actually be an issue now that McToys is trying to get back into doing articulation. They have a balljointed head, swivel/hinge shoulders and elbows, balljointed wrists, a balljointed chest, swivel waist, H-hips, swivel/hinge knees, and balljointed ankles. You don't really need the waist when the chest joint already takes care of that range of motion, but also, no one is making you use it. Zer0 may not be the most iconic character in Borderlands, but they're the first actual player character anyone has released. We've had a couple NPCs, and NECA made one of the enemies, but only McFarlane has made one of the characters you can actually choose to be in the game.